If, like me, you feel a little Bach goes a long way you may be tempted to ignore this new release. But wait, the music is played by none other than Masaaki Suzuki, whose multi-award-winning traversal of Bach cantatas for BIS is now complete. 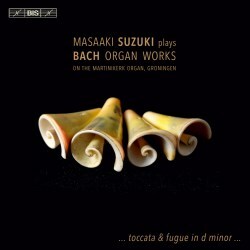 I know he's recorded this repertoire before - BIS 1037, for instance - but I wasn’t aware that Suzuki has been playing the organ since the age of 12, or that he received diplomas in both the organ and harpsichord from Amsterdam’s prestigious Sweelinck Academy. Given this Dutch connection it seems appropriate that he has chosen to play the Martinikerk’s Schnitger/Hinz organ, comprehensively restored by Jürgen Ahrend between 1976 and 1984. Seconds into the ubiquitous Toccata and Fugue in D minor and it’s clear this isn’t a run-of-the-mill recital. For a start the musical strands emerge with a clarity and degree of separation that one seldom hears in this blowsy blockbuster. In that respect Suzuki reminds me of Simon Preston, who also majors in such detail. There’s an echo, but as in Iveta Apkalna’s recent Bach/Glass collection it’s put to dramatic/precipitous use between flourishes. Also, I can’t recall an organ recording in which the building’s sonic ‘signature’ has been so clearly caught. The organ has a plain, unvarnished character, its woody ‘honk’ mated to a celestial treble in the F-major movement of the Pastorella. Suzuki invests each of these pieces with a distinct and arresting sound-world; the almost silvered sonorities of Partita VIII from the Partite diverse sopra il Corale ‘O Gott, du frommer Gott’ are a case in point. Really, this is a most versatile and cleanly voiced instrument, and it’s well behaved to boot. It can sound as imperious as any – just sample Partita IX – and the filigreed Fantasia in G major is crisply done. There’s plenty of bass heft too, but Suzuki and his engineer – Take5’s Hans Kipfer – resist the urge to turn this recording into something meretricious. Instead, what one get is a remarkably immersive and proportionate sound that’s also supremely well balanced. The Schnitger/Hinz pedals are simply magnificent; rather than stand out in an obvious way they segue nicely with the rest of this organ. Like the instrument everything else in this recording is a good fit; even that brilliant Fantasia, sometimes a tad overpowering, is judiciously – but compellingly – executed. Similarly, the Ariel-like flit and flutter of the Prelude and Fugue in C minor is anchored by a solid, wonderfully mobile bass; this makes for an unusually coherent and engaging performance. Blend, not bland, is the key word here. Dynamic, imaginative and well planned this generous programme has something for everyone. In other hands the Canonic Variations can seem a little dry, but in Suzuki’s they turn into cascades of pure loveliness. He has a firm and seemingly intuitive way with this flood of notes; undammed by awkwardness or artifice they are allowed to flow most naturally. It helps that Kipfer has provided him with a recording of such impressive reach and fidelity. These skills really come to the fore in the denser passages of the Prelude and Fugue in E minor; indeed, there’s an astonishing depth and complexity of contour to the sound here, the likes of which I’ve not encountered in ages. If you like Bach – and even if you don’t – this is a mandatory purchase. Musical and technical values are well up to the standards of the house and Albert Clement’s lucid liner-notes are a bonus. Really, in these straitened times it’s heartening to find a label that still holds to its core values; long may that continue. This is the kind of musicianship that changes minds; standard-setting sound, too.